Surrey Heritage is celebrating two success stories with its ground breaking work using the Brookwood Archive with staff and members of Woking MIND. 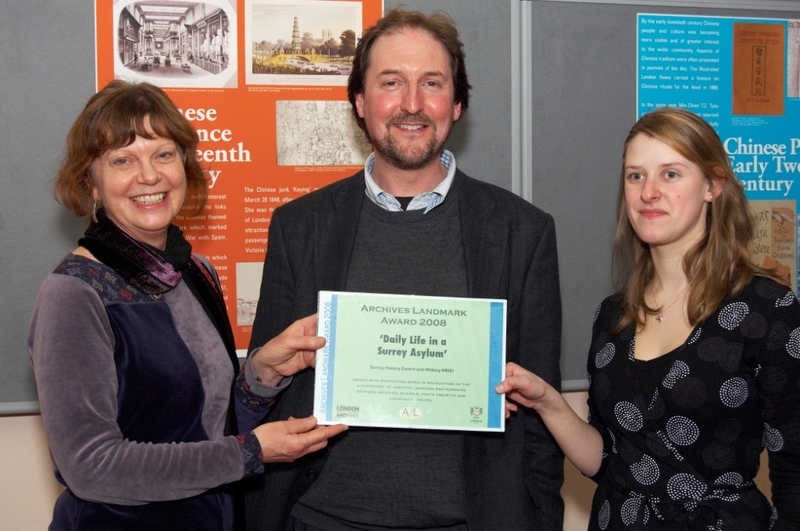 Surrey Heritage has been awarded an Archives Landmark Award 2008. The Archives Landmark Award (ALA) is given by the City of London, London Metropolitan Archives (LMA) and Archives for London Ltd (AfL) in recognition of innovative and original projects which make creative use of archive material and which make a real contribution to the community. Wednesday 25th April 2007 was an important day for Surrey History Centre in Woking. The Centre hosted its first seminar in association with Woking MIND. This was the second stage in a partnership being developed to explore the ways the documentary records can be used to help understand how the care and treatment of people with a range of mental health problems has changed and is changing. The emphasis on this exploration is not on an academic approach but on understanding, recording and making heard the memories, feelings and responses of those most closely involved – the medical staff, the patients and their families and friends. In Spring/Summer 2006, Julian Pooley, Public Services Team Leader for Surrey Heritage, had been approached by Mike and Janey, two organisers of Woking MIND, for help in doing some research in to the records of Brookwood Hospital which had been prompted by an argument over an early plan of the building. Mike and Janey had both worked at Brookwood Hospital before it closed in 1994 and both are passionately concerned that the voices of the patients are not heard in the records and so needs to be recorded before it’s too late. At Mike and Janey’s invitation two members of staff from Surrey Heritage (Julian Pooley, Public Services Team Leader, and Janet Nixon, Learning Officer (Archives)) attended a regular informal MIND meeting at the Corner House in Woking. This was a group with a wide educational background that was not interested in the history behind the records but in their own experiences and past. A careful selection from the vast photographic archive had been made with Mike and Janey’s help and this was copied and taken along as a prompt to discussion. The photographs had been selected in discussion with the MIND specialists as they were aware of what the responses were like to be and at the first session we all wanted as positive a response as possible. We recognised that our expertise lay in the documents and not in running this kind of a session. At this group meeting we could only watch and admire the way a diverse group with very different emotional responses was handled by the experts who understood and were trusted by the participants. A review was held with workers from Woking MIND following this session and it was decided to take this work further and wider. A seminar was suggested at which a number of speakers, chosen from those who had worked at the hospital and who would be familiar to the ex-patients, would be invited to give short talks about the hospital and their time there. It was felt that Surrey History Centre, as repository for the Brookwood archive, would be a good host for the occasion. Surrey History Centre also has good facilities for this kind of event with a meeting room that can hold up to 80 and a small kitchen. The foyer at the Centre is bright and can comfortably accommodate archive displays. After further meetings to discuss arrangements we discovered that we had very little to do! Workers and friends of Woking MIND took care of contacting the speakers, organising catering (including a lovely buffet lunch), distribution of most of the publicity to local groups and members of the organisation, registration and clearing up. At Surrey History Centre we arranged a display of some of the photographic material from the archive and liaised with the local museum (The Lightbox) for loan of one of their panels on Brookwood Hospital with a DVD film which includes material from the archive and was funded by the Wellcome Institute. Following lunch, Julian Pooley agreed to give a short talk on the records in the archive. With the exception of Julian Pooley’s talk on the archive documents all the talks were in the morning. We know that this event was not just about the talks, it was an opportunity for people to meet old friends and new, to reminisce and, sometimes, to air views on current issues. We arranged the timetable to allow for a lot of chatting time. Talks were more interactive than we usually see at the History Centre but as all the speakers were experienced at handling a lively crowd we had a fascinating morning. It was difficult to count the number of attendees as there was a lot of movement in the audience, but we reckon that it must have been around 90. Interestingly, a number of visitors came in to Surrey History Centre, looked at the displays and film, had a cup of tea and talked to MIND members who had not gone in to the talks, but then would not go further. For some, the reluctance to join in with the larger audience seems to have been a fear of stirring old emotions which were obviously in conflict with a desire to be associated in some way. For many who had been connected to Brookwood Hospital it provided more than medical care or a place of work, it was a home, a centre of stability and friendship and for some a refuge from a world they find hard to live in. Some brought their own photographs to show (we were able to borrow some to copy for the archive) and one ex-nurse donated the key to the Men’s ward that he had kept when the hospital closed. As we had representatives from the museum there we were able to hand this over to them with his approval. However, he wouldn’t let us have his whistle (a safety device) as his emotional attachment to that was too strong. Before this day, we knew of the academic interest in the old mental health hospitals and asylums, and we had been told of the interest in the local community, but it was not until we hosted this seminar that we understood just how strong and how important that interest is to the people who had lived and worked in the hospitals. This is not an interest we can abandon now. We have been approached by representatives of groups similar to Woking MIND but with their roots in hospitals in other parts of the County. They are also interested in raising the profile of those in their communities who have, or have had, mental health problems and who have lived in the hospitals before their closure. We have seen for ourselves how promoting the documentary record within the ‘mental health’ community can gather friends together and can help the wider community to understand and respect medical staff and patients. Since the first part of this report was written in Summer 2007 Surrey Heritage has strengthened its relationship with Woking MIND by repeated contact with the group including accompanying them to a performance of a local history drama and dropping in to the Christmas party. 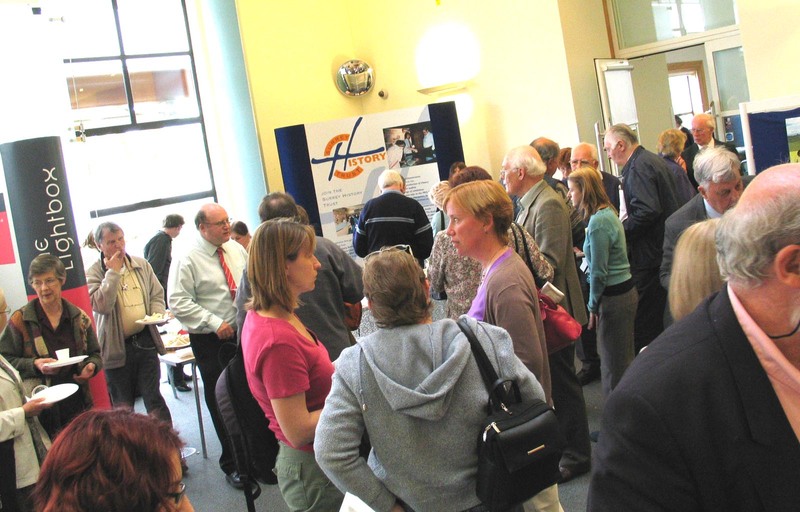 Surrey Heritage is also delighted to have been asked to host the group’s AGM in May this year (2008).